The goal of the Equilibirio game is to use building blocks to replicate the picture designs in the booklet in a 5-minute time frame without the pieces falling. The picture designs increase in the level of difficulty as you go. Equilibiro helps refine eye-hand coordination, encourages problem-solving, and promotes visual perception and spatial reasoning. Ages 5 and up. Jungle Party is an interesting new board game that encourages visual memory and problem-solving. Players take turns walking through the jungle to reach the King Toad. As you play its important to remember which animal moves where to determine your next move. This craft set comes with everything you need to make your own Fuzzy Monster Puppets. Engaging in craft activities is beneficial for children because it promotes creativity, helps refine motor skills and builds self-esteem. Create your own rings, necklaces, bracelets, and other designs with Pop Beads. Pop Beads help develop hand muscles and hand arches, which are necessary for good fine motor skills. Pushing and pulling the pop beads apart requires the use of strength, and provides extra sensory input to the joints (proprioceptive input), which is calming and organizing for the brain. Race to 10 is a fun, fast paced math game where players add and subtract numbers to try and reach the sum of 10. I've played this game before and kids love it. 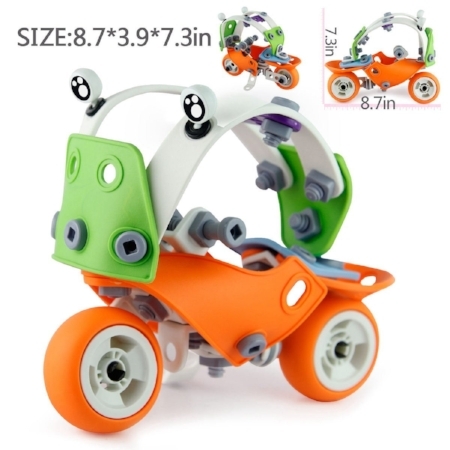 PowerClix is an open-ended magnetic construction toy that promotes creativity, imaginative play, motor skills, coordination, and spatial reasoning. Outfoxed! is a popular cooperative board game where players move around the board collecting clues to see who can crack the case of the stolen pot pie. This game promotes problem-solving, logical reasoning, teamwork, and creativity. Ages 5 and up. Qwirkle is similar to Dominoes, but with a fun new twist. Players take turns matching either by shape or color to collect points. You get a "Qwirkle" when you have six of the same color or number in a row. Qwirkle encourages problem-solving, sustained attention, and visual perception. Ages 6 and up. Memory Yoga is a great way to introduce kids to Yoga poses while simultaneously working on attention and visual memory. Players take turns searching for matching yoga poses. The player that can hold the matching pose for 10 seconds gets to keep the match. 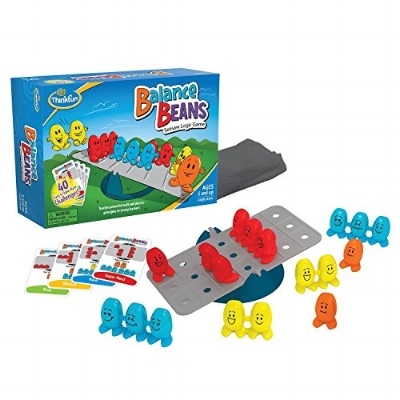 Balance Beans introduces kids to principles of algebra and physics. Set up the game according to your chosen card, then figure out where to add the rest of the pieces to balance the seesaw. This piano is soft and portable, and includes a play by color song booklet that kids can follow to play real melodies. Besides introducing kids to music and musical instruments, this toy promotes sustained attention, finger isolation (needed for fine motor skills), and ocular motor skills (needed for writing and reading). This realistic looking wooden Ukelele introduces kids to basic rhythm, strumming, and other musical techniques. Perfect gift for developing a love for music and musical instruments. Crankity is a fun brainteaser game that comes with a variety of challenge cards to solve. Slide the challenge card under the grid, place gears as shown, then use the remaining gears to connect the red and yellow. The puzzle is solved once all the gears are able to spin. Crankity makes a great travel game! Go Go Gelato requires the use of logic and visual perception to complete a Gelato order in the fastest time frame. Super fun game for kids 6 and up. Rush Hour Jr. is a fun one player logic game where players have to figure out how to move the cars out of the way to get the ice cream truck out of traffic. Rush Hour Jr. comes with 40 challenge cards that progress in levels of difficulty as you go. 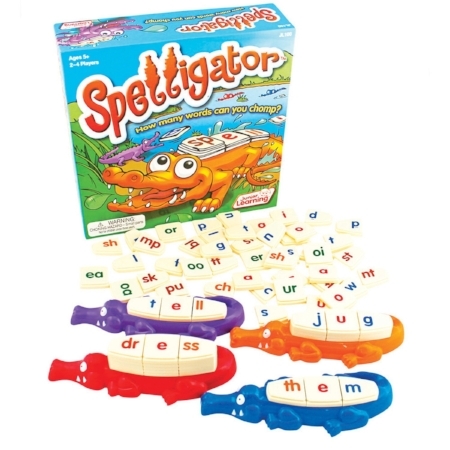 Spelligator is a fun new board game that teaches spelling, letter pattern recognition, and phonemic awareness. The player who makes the most words wins. This construction set by PBOX comes with 132 building pieces and a 23-page instructional step by step booklet that teaches kids how to create a bulldozer, helicopter, fighter plane, racing car, and motorbike (one creation at a time). This toy encourages fine motor skills, bilateral coordination (using two hands), visual-spatial learning, creativity, and sustained attention. Combine these unique coding bocks into sequences and patterns to create melodies and drum beats. Ipad required. Tiny Polka Dots comes with a set of cards that includes 16 different playful games involving logic, math, and numbers that are easy to adapt for any child. 5 Second Rule Jr. is a board game that comes with different questions that players have to answer within 5 seconds. 5 Second Rule Jr. is a ton of fun to play for the whole family. The answers will either be right or super funny.